Slow Cooker Bourbon Baked Beans - seriously delicious! 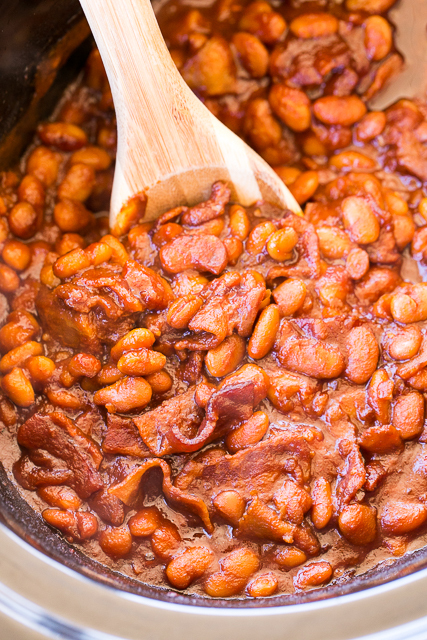 We love these easy baked beans! Great for potlucks and cookouts. Just dump everything in the slow cooker and let it work its magic! Northern beans, bourbon, tomato paste, molasses, mustard, Worcestershire, onion, garlic, bacon. Everyone RAVED about these beans and asked for the recipe. You can't go wrong with this easy slow cooker side dish recipe. 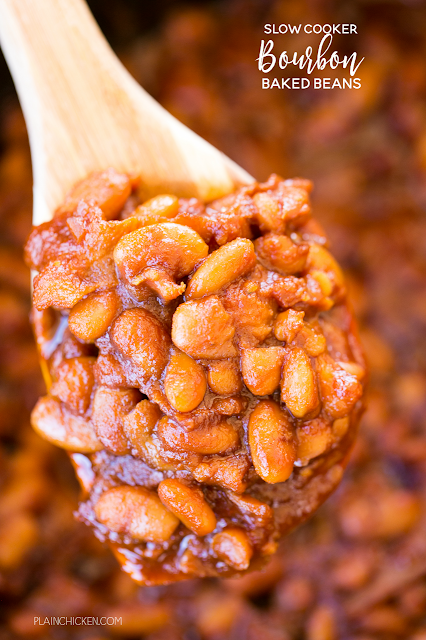 I think baked beans are a must for summer cookouts! Memorial Day & the 4th of July just aren't complete if I don't have some baked beans on my plate. These Slow Cooker Bourbon Baked Beans are definitely going to making an appearance at our table all summer long! SO good! I mean, BBQ and Bourbon. Enough said!! I cooked these Slow Cooker Bourbon Baked Beans low and slow all day. If you are in a hurry, you can cook them on HIGH for a few hours and they will be good to go. To save time on the day I made these beans, I cooked the bacon the day before. It seriously took all of my self-control to not eat the bacon and save it for the baked beans. The smell of the bacon drove Fluffy nuts! I may have given her a piece. Just don't let Jack and Squeaky know! LOL! Just a side note, I used Maker's 46 for the bourbon. That is Chicken Legs' bourbon of choice, so we always have some in the house. Use your favorite bourbon or whiskey for the beans. Just don't use something that you wouldn't drink. You can taste a hint of the bourbon, so you want to enjoy the flavor. Combine all ingredients in a 6-qt slow cooker. Stir to combine. Cover and cook on LOW for 8 hours or HIGH for 4 to 6 hours.